One night, Debi was performing with her band. Ron Bieganski was in the audience. After the show, he met her and told her how much he liked the music. She said thank you and told him she wanted to teach. This was perfect. All the teachers at Free Street were artists who wanted to teach. Debi taught at Free Street for many years in many capacities. She continues to make music and invite others to sing along in with her kirtan band Devi 2000. I came to Free Street around 1993, when David Schein and Ron Bieganski asked me to help organize a kids parade for the Wicker Park Art Weekend “Around the Coyote” event. I was muito feliz-- excited as I had been working as a back-up vocalist and percussionist for an Afro-Brazilian ensemble called “Malukosamba.” Now I had an opportunity to share what I was so passionate about-- the rhythms, dances and music that moved my soul. We started instrument making and working on ensemble lines and dances to create a rag-tag TRULY community parade. This is when I became aware of the ways of gentrification and how people who are the salt of the community often get left behind. So let’s take it to the streets! And we did. For many years, Free Street hosted summer workshops, often included in the daycamp, to prepare instruments, costumes, and marching formations. Our age group was 0 to 100, all were welcome. I ran the parade for about 5 years. We included the cool bikes from Humbolt Park’s Puerto Rican “Boricua” Bike Club of cool low riders, and the art-commuter-cyclist scene blossoming out of Wicker Park. I loved being a part of these parades. They were a bridge for communities to connect and include each other. My work with the Around the Coyote parade led to a teaching gig at Free Street, during the school year with the after-school programs and in the summer the camp program at Pulaski Park. I had the good fortune to hang out in the Free Street office on the 3rd floor a couple times a week, mostly with Anita, Ron and David Schein, as I was always at the Field House for the kids. I loved working with the kids, and we would do the coolest programs. I was learning to teach, mainly by observing the kids and what they were interested in. I had the freedom to create my own curriculums, within the responsibility of supervision by Free Street and the Park District. During summers, I also traveled to the different sites hosting Gallery 37 programs for teens. I led them in Yoga and Dance, and assisted the directors in creative movement. The parks were filled with teens learning job-skills, responsibility and theater putting together their own unique piece to perform for the Park District kids at the end of the program. This was a win-win city program for everyone. Kids learning by watching teens perform thoughtful, fun theater. The parks ranged from Cabrini-Green’s Seward Park to the Broadway Armory and beyond. Free Street provided substantial life-affirming program for Chicago youth at this time, backed by the City of Chicago. Through Free Street Programs I became a member of The Dance Center at Columbia College’s Community Culture Council. This allowed me to bridge Free Street, Pulaski Park and the area schools to programs from the Dance Center.Free Street hosted amazing programs at Pulaski Park, inviting three community schools--St. Stanislaus Kosta, Near North Montessori and Lozano Public School to performances by Dance Africa, David Rousseve/Reality Dance Company and Butoh dancers Eiko and Koma, to name a few. Free Street/Pulaski Park hosted many workshops with these international dance companies for the school kids, including my favorite with Japanese Butoh artists Eiko and Koma. They taught us all how to be still and take a shape. We became trees, got rooted and exploded in a lightning storm. Wow! Slow quiet kids, growing internally and busting out! Meeting David, Ron and Anita was a high point in my life. I was able to cross from the musical world into the world of teaching and theater. I am grateful David and Ron for introducing me to new ideas and having faith in my blossoming teaching abilities. I met and worked with so many deeply talented people, including Jaq. Westhead, Amanda Lichtenstein, Tina Wright, Jennifer Viets, Tanya White and many more. . 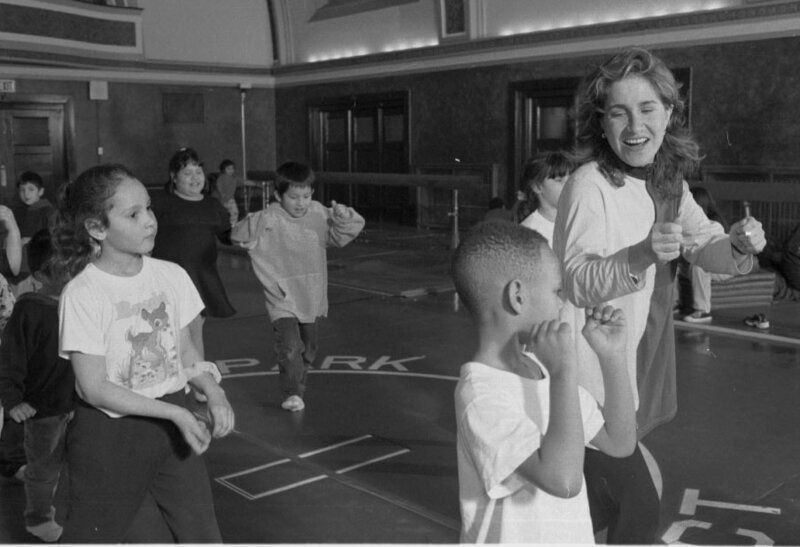 When I received my Yoga Teaching Certificate in 1995, Free Street hosted weekly classes for almost 5 years. Practicing Yoga in a park district felt ecumenical. . . .taking the practice to a public place for anyone/everyone to practice. Some may feel intimidated by walking into a yoga center, but the graffitied theater on the 3rd floor was a safe spot to come and learn. From the feedback received over the years, many are still practicing and grateful to Free Street for their first introductions to Yoga. Ron and Anita contacted me in 2016 to assist in the musical direction of NeuroKitchen’s Tin Can. I recognized a few of the Free Street kids that had grown up and were still performing, and met a slew of young expressive talent. I was honored to work with Stone-- the legendary drummer and creative now living in Montreal. The work behind Tin Can was thought provoking and educational. I learned about space, black holes, and family issues. Prop Theater was the perfect host for the performances. This was one of the best theater pieces I have seen, fully formed, multi-generational and diverse. It was a pleasure to work with the crew. Thank You Free Street for giving me the skills and props to move into the 21st Century and stay current with the likes of NeuroKitchen.